Regret a tattoo? Do you want to go back to your bare skin or do you just want to fade your old tattoo to get something trendier? You don’t have to spend thousands of pounds anymore! Laser or non-laser tattoo removal available. Laser tattoo removal works by breaking up the ink particles that are in the skin. Our lasers aim to break up the ink into smaller particles, which are then much more easily removed from the body through the immune system. The body’s immune system will treat the ink as if its a toxin and will push it through the lymphatic and urine system out of the body. Our Active Electro-Optical Q-switched Nd: YAG Laser uses flat-top beam laser technology which provides uniform beam profile. This technology is adopted by the best lasers on the market and its advantage is that it works on the skin with the same energy on every point of the beam, it’s safer and delivers greater results. Our fully qualified and experienced technicians deliver visible results already after the first treatment. 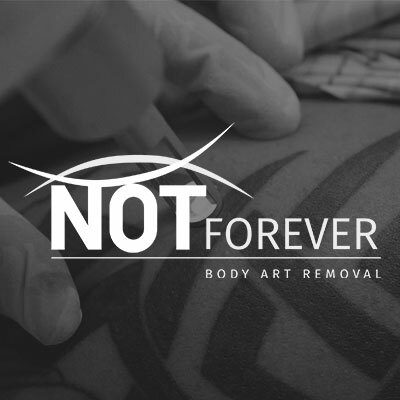 Our team at “Not Forever Body Art Removal” are experts in advanced tattoo removal. Our professional technicians aim to make the experience of tattoo removal as comfortable as it can be and we will always be honest and truthful. We also provide the best possible aftercare and ongoing advice once the treatment is over, at ‘Not Forever’ we are with you through the whole journey. I’ve had 3 or 4 treatments so far and I am extremely happy with the results! I can see the tattoos are fading well and the staff are brilliant. My main fear about getting my tattoos lasered was obviously the pain. I can honestly say that it isn’t anywhere near as bad as I anticipated!